Washington - Amtrak train crashed in DuPont City, Washington, and its carriage fell off the bridge. Known 13 of the 14 carriage trains crashed into the highway. Quoted by Reuters on Tuesday (19/12/2017), it was delivered by a spokesman for Washington State Patrol Brooke Bova. Five vehicles and 2 semi-trailer trucks passing by are mentioned affected by this train accident. A total of 77 people were transported to hospitals in the area of ​​Pierce and Thurston. The Tacoma-based CHI Franciscan Health Healthcare Network states that 4 patients are in very bad shape. Another 20 patients were treated at the Madigan Army Medical Center in Tacoma. "Nine are in 'serious but stable' condition," said the man at the Madigan Army Medical Center in Tacoma. Earlier, several people were reported killed in the train incident. The cause of the train slipping is unknown. The Amtrak Train Spokesman said there were 78 passengers and 5 crew on the train. Images from the air show how the carriage is off the track and hit the woods. 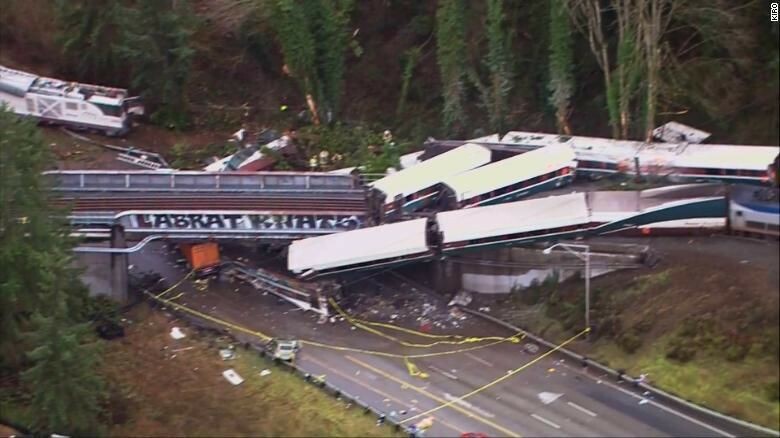 0 Response to "Amtrak Train Crash, 13 of 14 Fallen Wagon from Bridge"